While spaghetti is still warm, stir in parmesan cheese, egg, and margarine in a large bowl. Pour into well greased 10 inch pie plate and pat mixture up and around sides with a spoon to form a crust. Spoon cottage cheese over spaghetti crust. 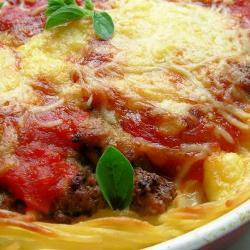 In a skillet, brown ground meat, sausage, and onion, then drain off fat and add tomato sauce and seasonings. Spoon meat mixture over the cottage cheese. Arrange mozzarella on top and return to oven just until cheese melts.